I remember the first cake that I baked for my husband while we were dating. I proudly made it from scratch and served it to him, ready to show off my baking “expertise.” He took one bite and then said “It’s good but it tastes a little hard.” I burst into tears and fled from the room, vowing to break up forever with this ungrateful man! After I calmed down, I returned to the kitchen where my cake was sitting and took a bite. Hmm…this cake was not just a little hard, it was like chewing on a boulder. And so began my love affair with Duncan Hines. I was thrilled to discover that Duncan Hines has recently released a new line of Decadent Cake Mixes, including Apple Caramel cake and Triple Chocolate cake. With fall arriving, I couldn’t decide which cake to make first. My husband requested the Apple Caramel cake with real apples so I decided to surprise him for dinner. The scent that filled the air while baking made my mouth water in anticipation. My family was so excited to have this wonderful treat for dinner that all three of my little ones volunteered to clean their rooms and feed the dog so that they would be allowed to have dessert. The Apple Caramel cake was like being transported from the 90 degree Florida heat directly into fall. It reminded me of visiting the apple orchards in Ohio and it was so moist and tasty. The Triple Chocolate cake has real chocolate chunks and rich fudge. 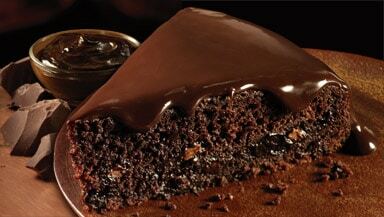 I have made no secret about my love of chocolate and this cake rivals any chocolate cake that I have ever had. It is gooey and decadent and I had to resist eating the entire cake before serving to my family. My children proudly declared that “Mommy, you are the best cook in the whole wide world.” I just smiled, knowing that they are still too young to understand that mommy had a lot of help from Duncan Hines. If you are hosting a fall or Halloween party or simply want to share a delicious dessert with your family, then I highly recommend the new Duncan Hines Decadent cake mix line. It has zero grams of trans fats and no hydrogenated oils which is important to me in any product that I serve my family. Your guests and family will thank you! 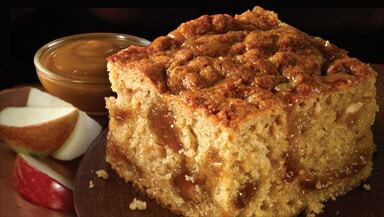 Go to Duncan Hines and check out all of the new and innovative recipes to help you with your holiday baking. Here is just one of the yummy recipes that I will be serving at my families annual Halloween dinner party. 1. Mix Duncan Hines Triple Chocolate Decadent Cake as directed on box. Reserve the chocolate fudge pouch to be used in the filling. Do not mix into the cake. 2. Spoon the batter into lined muffin pan. Bake for 18 mins. Allow to cool. 3. While the cupcakes are baking, beat together the marshmallow fluff, the softened butter and the chocolate fudge pouch (mixed according to box with 1/3 cup water). Cool until firm enough to frost with or pipe into cupcakes. 4. With pastry tip, pipe filling into center of cupcakes or cut a cone shape out of center of cupcake. Fill with tablespoon of filling and replace trimmed off top and plug hole in cupcake. 5. Frost with favorite Duncan Hines Frosting. I like Hip Fusion Designs Hippy Beaded Bracelet at your Open Sky store. I would like to try the Pumpkin Pie Crunch recipe. Spooky Surprise cupcakes look fun!